This is the ultimate custom plush throw blanket, combining the softness of micro fur with the softest, most luxurious faux Alpaca wool. 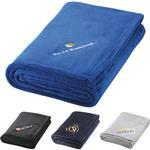 Feeling this throw is an unforgettable experience, so soft it caresses your skin. Machine washable. 100% polyester. Our company was the first to use a hidden zipper to allow for ease of embroidery so that it does not show on the reverse side of this throw. Comes in Mocha, Steel Blue, Spruce and Taupe. Price includes 7K stitches of embroidery. 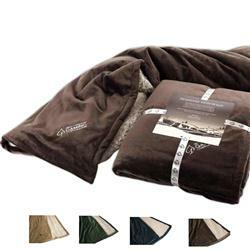 Available Colors: Comes in Mocha, Steel Blue, Spruce and Taupe. Production Times Available: 7 to 10 business day production is standard. Rush available, please call! 50" x 60". 60" x 72" available! Available Imprint Options: Embroidery or Patch. 26 Pounds per 10 pieces.